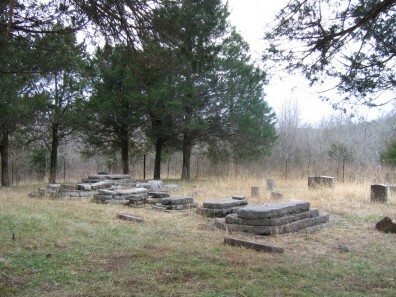 There are a number of historical cemeteries located within the boundaries of the Buffalo National River Park throughout Newton County, Searcy County, and Marion County, Arkansas. Some of these cemeteries remain active and have access to them. However many others, mostly family cemeteries, have been abandoned with all vehicular access cut off after the National Parks Service assumed control over the territory in the 1970's. According to the official Buffalo National River East and West Maps sold by the National Parks Service, as well as other information found in cemetery books and online, the following is a list of cemeteries known to be located within the park boundary. These are separated by county, but are otherwise in no particular order. All photographs were obtained from the public domain with no copyright restrictions indicated unless otherwise noted. 1. Whiteley Cemetery: Located off State Highway 21. This is a small cemetery with approximately 8 grave sites. About a mile or so past the Boxley Church, going South across and past the Boxley bridge, you will see a sign for the "Buffalo River Trailhead" hiking trail. Turn in and park. There will be a large sign that says "Upper Buffalo Wilderness" and descriptions of the various hiking trails. The actual Buffalo River Trail (BRT) begins across Highway 21 on the opposite side from the parking area. 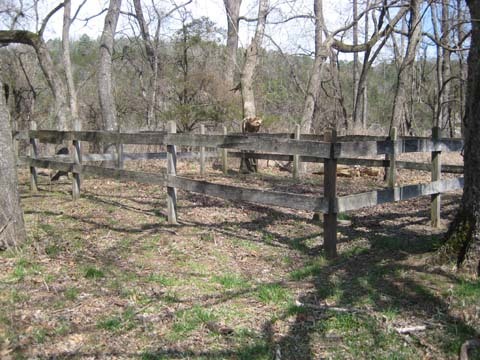 You will then walk up the dirt road in front of the parking area a short distance to a wooden structure. There will be another, much narrower trail on the left in poor condition with a cable and sign that says "no parking". Cross the cable and hike up the twisting trail to the top of the hill. The small cemetery will be at the top of the hill on the right adjacent to the trail. Approximate coordinates are 35.56.383N, 93.23.587W. 2. 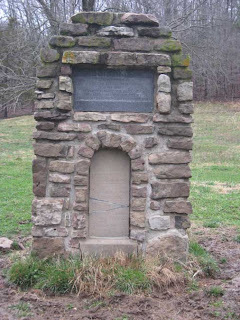 Walnut Grove Cemetery: Located off State Highway 21 near the Boxley Baptist Church, south of the Boxley Historical Area. This is a signed, gated, and well maintained cemetery with approximately 150+ grave sites. Approximate coordinates are 35.58.415N, 93.24.145W. 3. 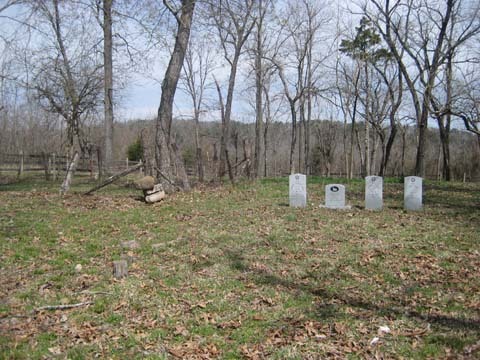 Villines Cemetery: Located off State Highway 43 between Ponca and Boxley. There are approximately 125 grave sites in this cemetery. 4. 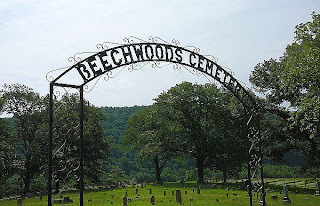 Beechwood(s) Cemetery: Located off State Highway 43 on a side road leading to the Lost Valley recreation area. The cemetery has an arched sign and is located near an old community building/school. Approximate coordinates are 36.00.33N, 93.22.02W. 5. Jones Cemetery: Located along the NW section of the Cecil Cove Trail. The small cemetery contains 19 graves, 12 of which have legible gravestones. The cemetery is in a heavily wooded area and is enclosed by a wire fence with a metal gate. It is reported that this cemetery is very difficult to get to and that a guide may be needed to find it. Approximate coordinates are 36.09.618N, 93.26.740W. 6. Cherry Grove Cemetery: Located along the Buffalo River Trail (BRT) to the South of the Erbie (historical area), opposite bank. The cemetery sits on approximately 1 acre of land. There is a wooden sign. There are approximately 74 known grave sites and many unknowns. The approximate coordinates are 36.04.337N, 93.14.005W. 7. Young Cemetery: Located about 1/2 mile SE of Erbie (historical area). Go past the "Jones Clagett" house, then park and walk East to a pond about 75 yards. Then walk another 75 yards uphill to the cemetery. There are 3 grave sites here. Approximate coordinates are 36.04.453N, 93.13.316W. 8. Adair Cemetery: Located along the Buffalo River Trail (BRT) between the Erbie river access area and the Cedar Glade river access area. 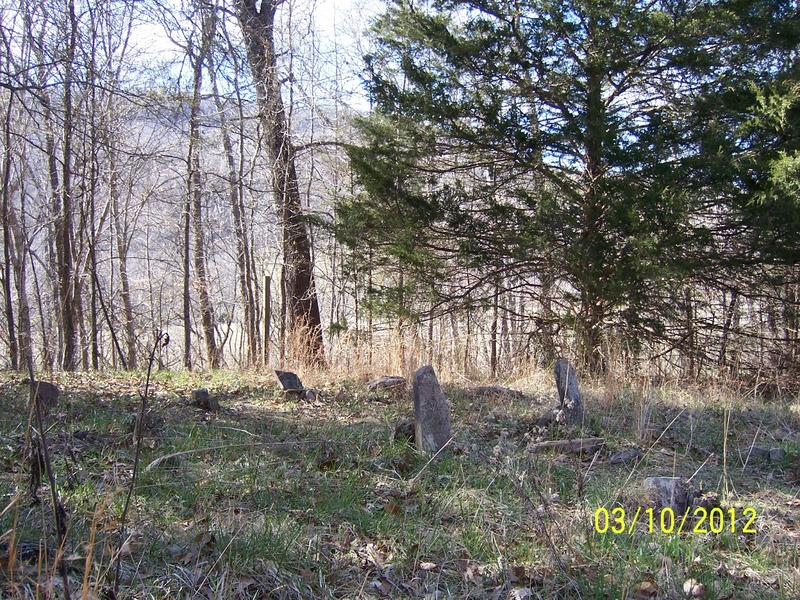 This is an old family cemetery on the homestead of John Adair. It is in the NE 1/4 Section 4, Township 16N, Range 21W, Track #51-110 of the Buffalo River National Park. There are 8 identified marked graves and 11 unknowns marked only with field stones. The cemetery has a wooden fence and is well maintained. Approximate coordinates are 36.3.55N, 93.11.41W. 9. Brown Cemetery: Located on the right side along the road to Erbie and the Buffalo River Trail (BRT) just NW of the Cedar Glad picnic area. There are approximately 20 grave sites at this cemetery. Approximate coordinates are 36.03.23N, 93.10.43W. 10. McFaddin Cemetery: Also spelled "McFadin", located North of the Cedar Glade river access area, North bank of the river on the North side of the river trail designated as ORT. This is a small family cemetery located about 1/4 mile from the McFadin house site at the edge of the wood line. The overgrown cemetery contains at least 5 grave sites and is fenced. There are no legible markers. 11. 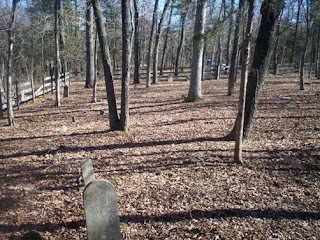 Shaddox Cemetery: Located on a road North of the Lower Pruitt Landing river access area, North side of the river. From Jasper go North on State Highway 7. Turn right after crossing the Buffalo River bridge at Pruitt. Stay on the main road for about 1/4 mile, then turn right at the first turn and continue about 1/4 mile down this road to the cemetery. 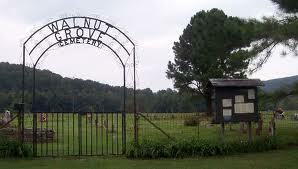 This is large cemetery with approximately 380 grave sites with an arch sign. Approximate coordinates are 36.03.744N, 93.08.003W. 12. Deffenbaugh Cemetery: Located about 2 1/2 miles upriver from the Hasty river access area, North side of the river. There is a sign and a fence, but the cemetery is endangered. There are 9 known burials here, all from the Collins family, with possibly as many as forty unknowns. The cemetery can be reached only by river. There is a small path leading up a slope from the river to the cemetery. It is extremely overgrown with vegetation and saplings. According to one source, none of the stones have legible names, dates, or inscriptions. 13. 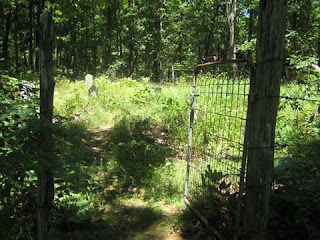 Collins Cemetery: Located along the Hasty Cutoff Road, South/SW of the Hasty river access area. This is also called the Armstrong Cemetery. 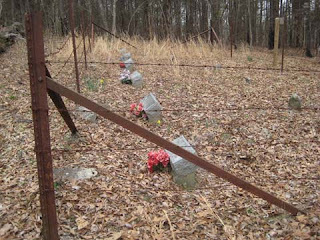 This country cemetery is enclosed by a barbed-wire fence. There are 35 graves, 15 of them with legible markers, in four rows. The cemetery seems to be somewhat grown up or uncared for. Approximate coordinates are 36.00.302N, 93.05.218W. 14. 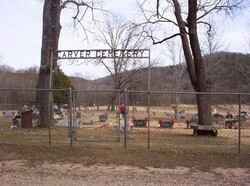 Carver Cemetery: Located just off State Highway 123 before crossing the river near the Carver river access area on the right (S/SE) side of the roadway. The cemetery is fenced with an arch sign. There are approximately 230 grave sites in this cemetery. 15. Morris Cemetery: Located on a hill above the river East of Hasty or about 3 miles SW of the Mount Hershey community. It is at the edge of a pasture on the North side of the river. The cemetery is surrounded by a barbed-wire fence with a metal gate. The cemetery is heavily overgrown with briars, brush, and trees. There are four grave sites in this small family cemetery. Approximate coordinates are 35.99.81N, 92.99.57W. 16. Aydelotte Cemetery: Also spelled without the "e" at the end. Located across the river from the Mount Hershey river access area, South side of the river near the remains of an old barn in Section 30, Township 16N, Range 19W. There is evidence of at least four grave sites here dating from the very early 1900s. 17. Sullivan Cemetery: Located on a trail to the right off the end of Pea Ridge Road. Sources indicate that it is located on the North side of the river across from Cave Creek. It is reported to be in a wooded area and very difficult to locate in Section 1, Township 15N, Range 19W. 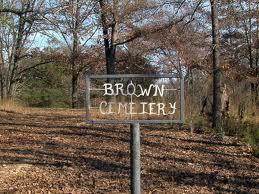 It may also be called the "Cane Branch Cemetery". 1. Still Cemetery. Vehicular access available on county road leading to the South Maumee river access area. The cemetery shows to be in a clearing on the right a short distance before reaching the access area. 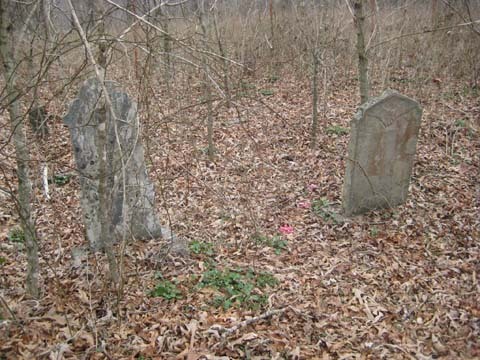 There is another Still Cemetery located in Marion County, but it is not within the national park boundaries. 2. Shipman Cemetery. Located upstream from the Spring Creek river access area, on the opposite bank. The map shows it to be on a trail going off from the end of Fletcher Ridge Road, bearing to the left. No vehicular access. 3. May Cemetery. Vehicular access available on the county road (Spring Creek Road) leading to the Spring Creek river access area. Cemetery shows to be on the left a short distance before reaching the access area. It may not be visible from the roadway. 4. Slay Cemetery: Also called the "Slay Branch Cemetery". From intersection of State Highway 74 and State Highway 377 in Snowball go North on CR 16 for 6/10th mile. Then turn left and go 2.4 miles. Next turn left and go 1 mile to the Nelane bridge. Then turn right and go 1/10th mile. Next turn right and go 6/10th mile. Then turn right and go 1/10th mile until you see an old walnut tree on your right. 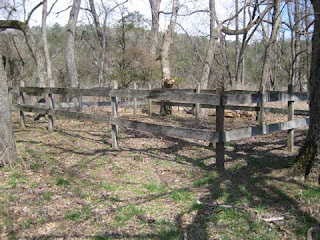 Look to the left and watch for two treated wooden posts on high ground. Walk to the second post and then turn right and into a cane thicket about 30 feet. The cemetery is believed to contain 25 grave sites, with 14 having legible headstones and the remainder with unmarked field stones. The last burial was in 1905. 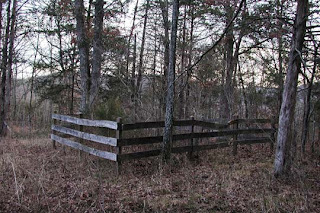 The cemetery is enclosed by a 3 rail board fence. The cemetery was cleaned up in 1994 by the Boy Scouts of America - Eagle rank project. 5. Nars (Narrows) Cemetery. Located off State Highway 374 from St. Joe toward Woolum. Ford the river at Woolum. About 1/2 mile South of the ford is a bluff. The cemetery is at the top of the bluff. No vehicular access and no road. There are 17 graves marked with legible stones having names/dates and 16 with unmarked field stones. The cemetery is fenced. The last burial was probably in 1967. 6. Christy (Christie) Cemetery: Located in Section 2, Township 15N, Range 16W. 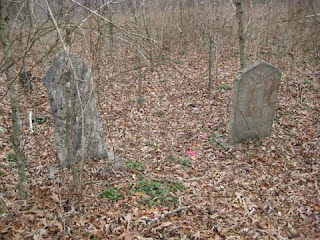 The cemetery sits in a wooded area West of the river approximately 1 1/2 miles East of Woolum. The only access is by river. The cemetery contains 57 graves, 17 with legible gravestones, but most of which are marked only with field stones offering no identification. The cemetery is overgrown with weeds and tall grass. 7. Arnold Cemetery. Located in the Tyler Bend Park area near Silver Hill Section 3, Township 15N, Range 17W somewhere along the back side of the mountain near the end of CR 241. Information indicates 25 to 30 grave sites here, but that vandalism and theft of stones has occurred. The cemetery is said to be enclosed by a barbed-wire fence with a gate and a sign. 8. Horton Cemetery. Located in Bear Creek Township, approximate coordinates 35.59.413N, 92.41.426W. It is located approximately 1/2 mile South of the river and 4/10th mile East of Bear Creek. There are believed to be around 30 graves here, but only one of them is marked with a commercial gravestone. The remainder are marked with field stones or completely unmarked. 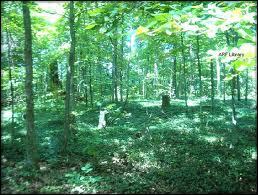 The cemetery is extremely overgrown with ground cover and vegetation and sits in a wooded area. 9. Hamilton Cemetery. Located near where Richland Creek runs into the Buffalo River. Very isolated and little access. According to the map, it may be accessible on foot from the Ozark Highlands Trail. It is on the South bank of the river, West of Richland Creek. 10. Lawrence Cemetery. According to the map, this cemetery appears to be located near the end of the old Brewer Road, North side of the river, which is now inaccessible to vehicles. There are approximately 65 grave sites in this cemetery, which is fenced. 11 graves have legible markers, but most of the graves are marked only with unidentified field stones. No other information available. 11. Hensley Cemetery: Located at the end of Polkberry Road, South side of the river. 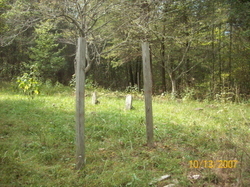 This is a small family cemetery located near a homesite. There are 6 graves within a fenced area, each with a replacement headstone containing names and/or dates, along with the original field stones at the foot of the graves. 12. 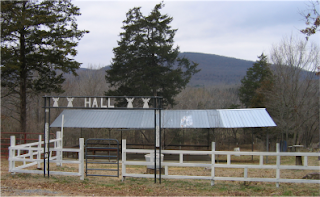 Hall Cemetery: Located on Richard Road (CR 12), East of Richland Creek, a little over 5 miles from Snowball. This is a fairly large and well maintained cemetery with a sign and pavilion. It contains the only positively identified African-American slave graves within the national park boundary. 13. Abbey Cemetery: Located just inside the park boundary on Woolum Road, NE of the Woolum river access area. 14. 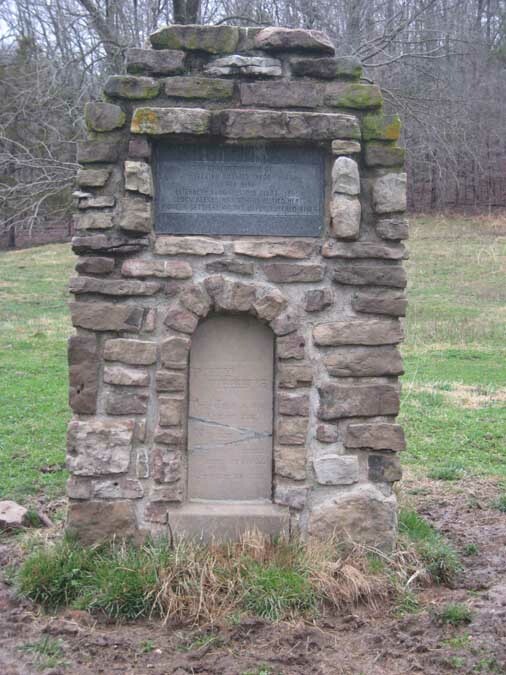 Lane Bend Cemetery: Located on the South side of the river, downstream from Grider's Ferry and Shine Eye. One source indicates the cemetery is at the end of CR 48, NE of Silver Hill in the river bottoms. It sits on a hill top and contains a substantial number of grave sites. There are believed to be only two markers with names and dates, with the remainder being marked by field stones. The cemetery is unfenced and cattle have trampled through it and knocked over stones. 15. White Cemetery: Located on a wooded hillside North of the river between Arnold and Tyler Bend. It can only be reached by river or by trail from the Highway 65 bridge. A 1991 survey indicates there to be 27 grave sites here, only 3 having legible gravestones. The cemetery is heavily overgrown and covered with young trees and saplings. 16. Old Arnold Cemetery: Located in "Arnold Bend" where the Arnold family lived in the late 19th and early 20th centuries. 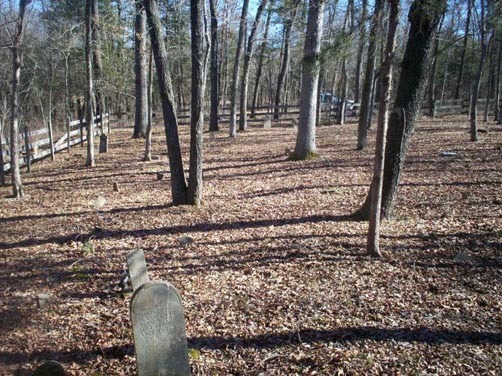 The cemetery is in a wooded area, and it is fenced and well maintained. Only three legible gravestone remain. It is estimated that there are at least 35 graves in this cemetery, but the exact number if impossible to ascertain. 17. Sanders Cemetery: This is a small burial site containing three unidentified graves marked only with field stones at the head and foot of the graves. They are believed to be graves of children. The cemetery is surrounded by a woven wire fence. No other information is know, and no specific location is identified in available records. 18. 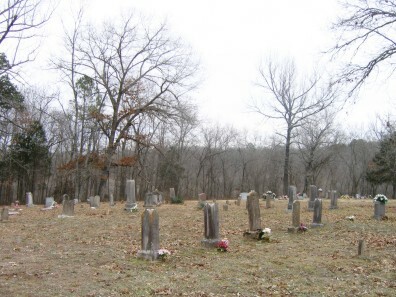 Sitton Cemetery: Located a few miles from Cozahome in Searcy County on the opposite bank of the river. No other information available. 1. 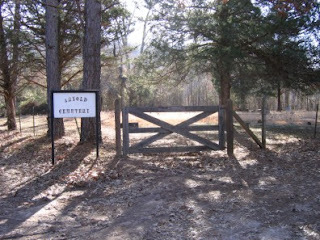 Laffoon Cemetery (also called Cabin Creek Cemetery). This cemetery is located a couple of miles downstream from Rush Landing at the Rush Historic District. Access is by hiking or horseback only. An old ore wagon trail leads toward the cemetery from Rush Landing, but the trail is in very poor condition and extremely overgrown with brush and tall river cane, which makes it very difficult to determine your exact location. All other access has been cut off. 2. Brantley Cemetery. Approximate coordinates are 36.06.20N, 92.32.05W. No vehicular access. There is said to be only two stones with others buried in unmarked graves. 3. Hepsey Cemetery. Approximate coordinates are 36.04.13N, 92.27.52W. No vehicular access. There are believed to be burials here from six families, but all graves are said to be marked only with field stones with no names or dates. The cemetery is about a mile up Big Creek from where it runs into the Buffalo River on the East side of the creek. This cemetery is very difficult to reach. You can take a boat or canoe on the Buffalo River to the mouth of Big Creek. The historic Cold Water School is also on the East bank of the creek near the river. There is said to be a trail that leads away from the school up the creek that will eventually pass nearby the cemetery. You can also come in by vehicle from the Cozahoma area in Searcy County, enter Marion County on Cozahome Road, then take Big Creek Road to the right off Cozahome Road. Follow Big Creek Road to the end and park. A trail leads away from the parking area down in the hollow where Big Creek is located. 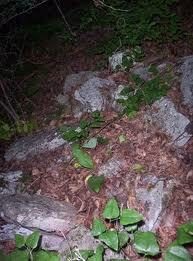 The trail is steep and rocky in places, and I considered it to be a strenuous climb back out. If you take the trail fork that keeps to the right, you will come to a high spot overlooking Big Creek. There is a clearing directly across the creek from this spot. The cemetery is supposed to be located in that area. The day I went in February, Big Creek was too wide and too deep to cross on foot to the other side, so I had to turn back. I imagine with the water level prevailing at that time, you could have canoed or perhaps even motored up Big Creek that far in a flat bottom boat. 4. Woodcock Cemetery. Approximate coordinates are 36.05.17N, 92.25.55W, Section 36, Township 7N, Range 14W. The map seems to indicate that the cemetery is at the end of a road/trail callled Spencer Ridge Road. No vehicular access. This is a family cemetery, but all graves are marked only with field stones with no names or dates. There may be, or may have been, two separate cemeteries here, one of them for the Woodcock family and the other for a group of soldiers who were killed there in a skirmish during the civil war. The area was called "Rock Fish" and had a post office from 1858 to 1866, with Henry Woodcock as the postmaster. Henry and his wife Deborah are buried in this cemetery along with 7 of their children. 5. Cow Creek Cemetery. Located on the banks of Cow Creek about 1/4 mile West of where it flows into the Buffalo River. No vehicular access. There is evidence of about 25 graves here, but only one of them is marked with a manufactured gravestone with a name and dates, with one other name being crudely carved into a field stone. Thanks for this site. 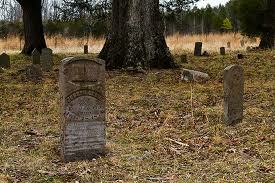 It is very helpful in finding and cleaning up neglected cemeteries.